My field of specialization is econometrics (i.e. statistical analysis of economic data). Improving the accuracy of econometric analysis plays a vital role in understanding the mechanism of our economy and testing the validity of economic theory. To this end, I am developing and applying new statistical methods with improved accuracy. Economic data can broadly be classified into time series data and cross-section data, each of which requires different methodologies. My primary interest lies in time series data since they have an immediate implication on macroeconomic forecasting, but recently I am expanding my scope to cross-section data as well. Below I present three ongoing projects of mine. Classical time series models require all data to have the same sampling frequency. Consider analyzing a dynamic interaction between unemployment and gross domestic product (GDP), for example. In many countries, unemployment statistics are announced monthly while GDP statistics are announced quarterly. Classical models force us to aggregate monthly unemployment data into a quarterly level. Such a temporal aggregation causes the loss of information and consequently lowers the precision of statistical inference. A new strand of research that emerged in the U.S. and Europe around 2004 attempts to exploit all data available whatever their sampling frequencies are. Such an approach is broadly acknowledged as "Mixed Data Sampling (MIDAS)" or "Mixed Frequency" recently. Many researchers report that the MIDAS approach leads to sharper statistical inference than the previous approach. 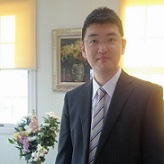 I have been studying theory and applications of MIDAS since I was a Ph.D. student at the Department of Economics, University of North Carolina at Chapel Hill (August 2009—May 2014). First, I defined Granger causality (i.e. incremental predictive ability) with mixed frequency data, and then proposed a test for the mixed frequency Granger causality. Second, I tested for Granger causality from weekly interest rate spread to quarterly economic growth in the U.S. Third, I analyzed the sluggish private investment in Japan’s Lost Decade, taking advantage of MIDAS. Photo: A poster presentation on MIDAS at the 25th (EC)2 Conference held at Universitat Pompeu Fabra in Barcelona, Spain, in December 2014. A time series is called white noise if its future values are uncorrelated with past and present values. Testing for the white noise hypothesis might sound like a primitive problem, but is actually a new and hard problem. A major challenge is that serial uncorrelatedness is a far weaker condition than serial independence. It is therefore difficult to establish a formal asymptotic theory under the null hypothesis of white noise. I am proposing a new white noise test that is based on the largest sample autocorrelation across lags. After extensive simulations, I found that my test detects remote autocorrelations more accurately than existing white noise tests. As an empirical application, I tested for the weak form efficiency of stock markets (i.e. white noise hypothesis of stock returns). 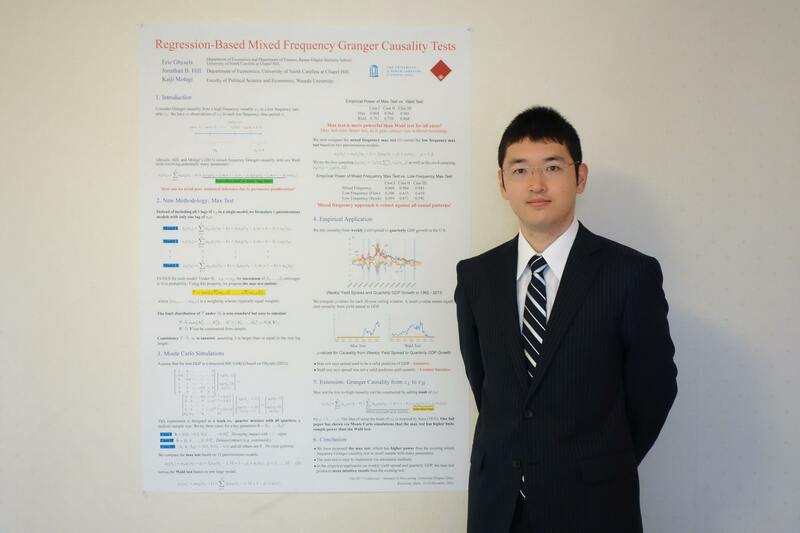 Photo: A poster presentation on white noise tests at the NBER-NSF Time Series Conference held at Columbia University, New York, in September 2016. 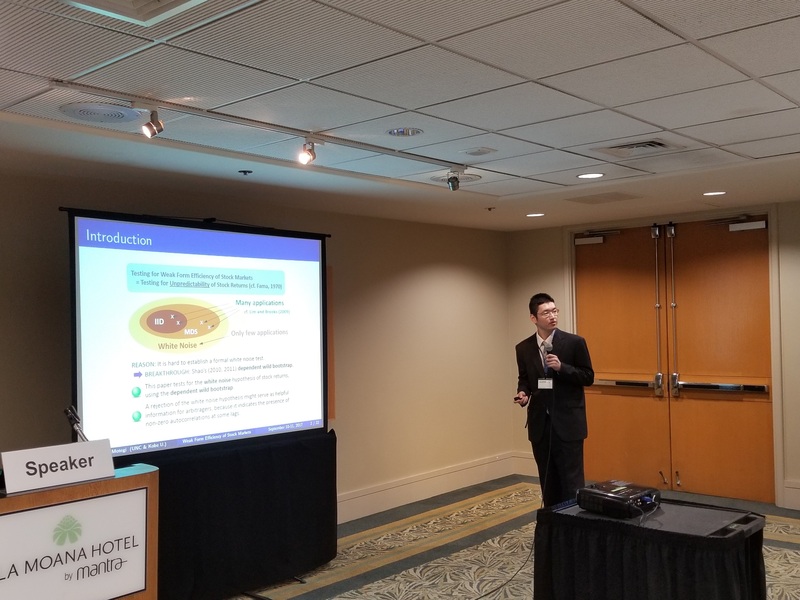 Photo: A presentation on the weak form efficiency of stock markets at the 3rd Annual International Conference on Applied Econometrics in Hawaii, hosted by the Graduate School of Economics, Kobe University, held at Ala Moana Hotel in Honolulu, Hawaii in September 2017. A recent project of mine attempts to unify copula models, missing data analysis, and causal inference with cross-section data. Copula models are a useful tool for capturing rather complex interdependence among multiple economic variables with a relatively small number of parameters. The literature of copula models had been built up on a complete-data framework, but missing data may well arise in reality. Taking household surveys as an example, respondents may refuse to provide their personal information such as age and income. In such a case we cannot apply existing copula models due to missing data. To address the problem, I am proposing a new estimation procedure of copula models which delivers correct inference even in the presence of missing data. My approach is based on a recent advance in causal inference with binary treatment effects. Binary treatment models and missing data problems share a conceptual similarity since to observe or not to observe data can be thought of as a binary treatment. I am not aware of any preceding study that unified copula models, missing data analysis, and causal inference. Given the vast literature on each of the three fields, I believe that this project is relevant for virtually any academic area involving data analysis. Photo: A seminar presentation at the Department of Statistics and Actuarial Science, University of Hong Kong (HKU) in June 2018. These are graduate level courses, taught in English, on theory and methods of time series analysis. A primary goal of these courses is to learn the literacy of time series econometrics so that students can perform a sensible analysis in their own theses. While a main focus will be put on theoretical and numerical aspects, I will also present empirical illustrations as much as possible in order to keep a reasonable balance between theory and practice. The required textbook is Walter Enders (2014, 4th edition) "Applied Econometric Time Series", Wiley. Supplemental books include James D. Hamilton (1994) "Time Series Analysis", Princeton University Press and Eric Ghysels & Massimiliano Marcellino (2018) “Applied Economic Forecasting Using Time Series Methods”, Oxford University Press. “Analysis of Stationary Time Series” offered in the 1st Quarter of 2018 covers the stationary time series literature including autoregressive moving average (ARMA), generalized autoregressive conditional heteroskedasticity (GARCH), and vector autoregression (VAR). “Analysis of Nonstationary Time Series” offered in the 3rd Quarter of 2018 covers the nonstationary time series literature including unit root, spurious regression, cointegration, and vector error correction model (VECM). Most economic time series are nonstationary in levels and stationary in the first difference. It is thus of great use to learn proper ways of handling both stationary and nonstationary time series. Some teaching materials of my present and previous courses are publicly available on my personal website so that students can preview and review the courses any time. Photos: “Time Series Analysis” offered in the 3rd Quarter of 2016. I always enjoy teaching “Analysis of Stationary Time Series” and “Analysis of Nonstationary Time Series”. 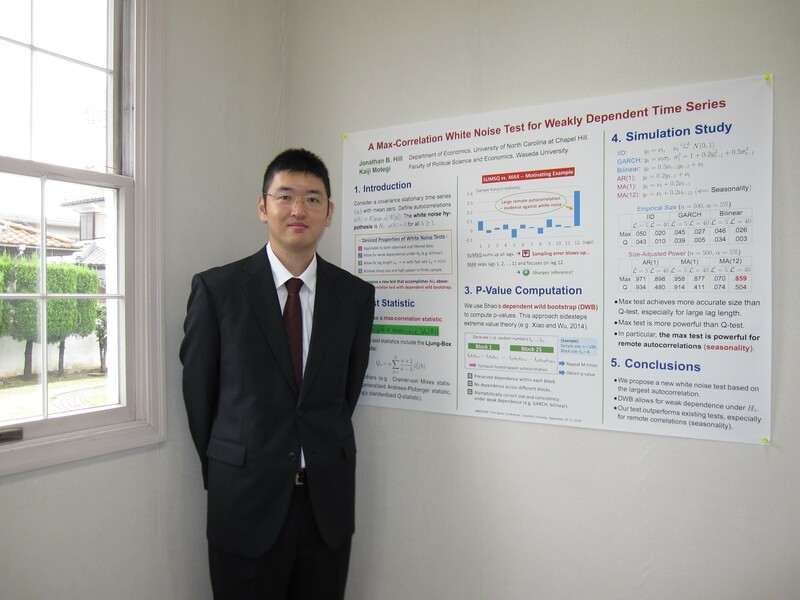 It is exciting to learn the theory and practice of time series analysis. Discovering dynamic characteristics of economic variables will definitely have a positive impact on the economic literature and our entire society. I am looking forward to seeing you in class.